In the dark mirror reflection of our planet that is Funcom's upcoming MMO The Secret World, three secret societies struggle to control and contain the mysteries too twisted and terrifying for mere mortals to know about. Some fight with subtlety. Others are the Templars. While the Dragon manipulates behind the scenes and the Illuminati party like its 1899, the Templars are busy fighting a war. The most militaristic of the three societies, the Templars are the sort of chaps that find one zombie in an alley in some remote village and decide that the only course of action is to burn everything to the ground immediately. It's a bit rash, but you can't argue with results, especially when you're dead. 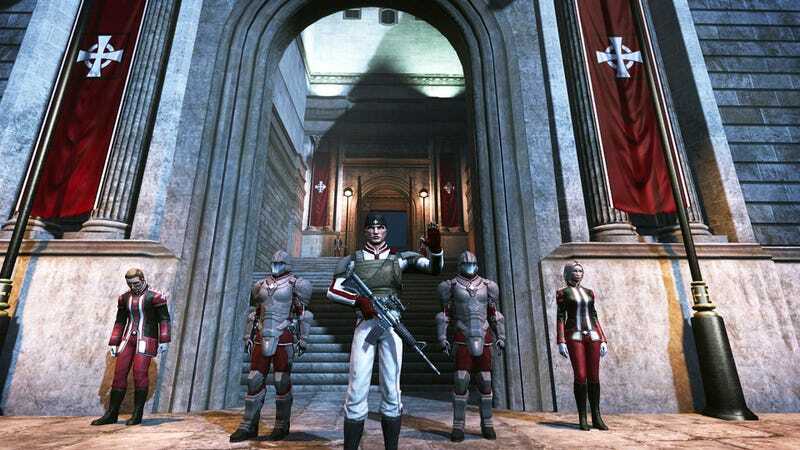 Funcom celebrates the Templars with a week of articles, videos, and new screens featuring the secret organization most likely to have ties to the Society for Creative Anachronism. "Going behind the scenes of the Templars secret society is both exciting and revealing; remarkably little is known about the inner workings of this organization despite its well known public image," Says Ragnar Tørnquist, Senior Producer and Director for ‘The Secret World'. "Uncompromising and fiercely brutal, the Templars is an organization with a single goal; to eradicate evil no matter how long it takes them. This is a great opportunity to shed some light on this secret society." Stay tuned to the official Secret World website for more Templar-flavored goodness all week long.